We've all been on the road in bad weather and know the tension driving in the rain can bring. The rhythmic thump-thud of the wipers and the feeling of the wet road under your tires. The sensation that, if you're not careful, you might lose control. The next time you see storm clouds on the horizon, remember these simple tips for driving in the rain. They'll help you get where you're going safely. If you're driving in the rain, stay toward the center as much as you can. Roads are designed so there's a very slight incline that makes water wash toward the sides. By driving in the centermost lane, you can make sure you're driving on the highest part of the road, where you don't have to worry as much about standing water. If you do come across standing water in the roadway, keep in mind that it only takes around 5 to 6 inches of water to reach the bottom of most passenger vehicles. You probably won't be able to go out and physically measure the depth of the water, so the safer bet is to find an alternate route rather than risk becoming stranded in your vehicle. Tires that are going bald are a hazard when it comes to driving on wet roads. If you know your tires are getting low on tread, consider replacing them. RepairPal has a helpful tire buying guide that could save you both money and time when choosing the right tires for your vehicle. Additionally, check your wiper blades. If they're getting old and ragged, it's time to put on a new set so you can see where you're going when the rain starts falling. Wiper blades should be replaced yearly. If you're unsure about how to replace them, check out our video below. 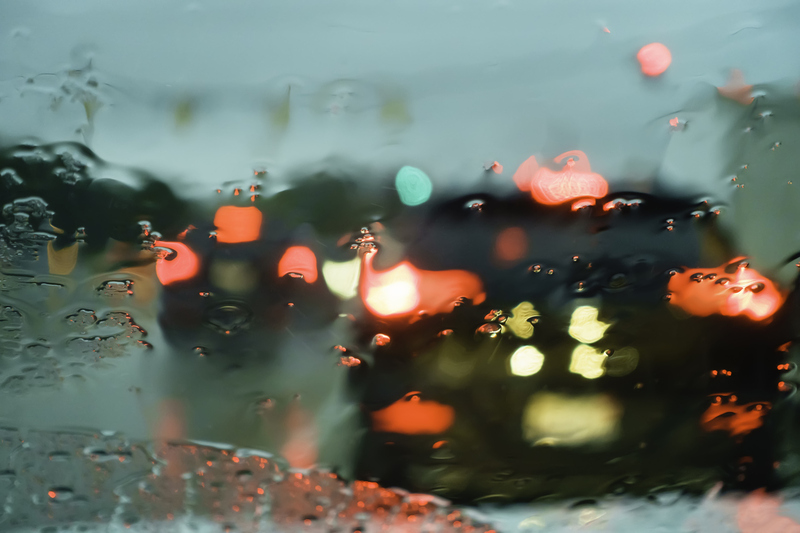 While it may be the most basic tenet of driving in bad weather, we all forget sometimes. A rainy day, in particular, is not the time to give your car the gas. Be cautious and drive slow. Make sure you have plenty of time and space to react to the traffic in front of you. Leave early for your appointments to be sure you aren't in a time crunch.